“Get Rich Blogging!” Are you ever drawn to articles or advertisements like this? A lot of people are unfortunately. It’s a complete come-on, but it does draw attention. 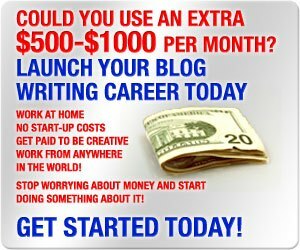 Think about it, would you be more drawn to an article or ad that says “get rich blogging” or one that says “make a living in blogging”? The second would be more informative and doable, but the first sizzles and that’s where most people will go. Human nature, I suppose—we’re drawn to impossible promises even though we know they aren’t true. Maybe we just want to be entertained or maybe it’s that “hope springs eternal” thing. We hope that we’ll be that one in a 100 or 1,000 who does hit the jackpot. I don’t need to tell you this—you probably already know it–very, very few people will ever get rich blogging The reality is that relatively few people get rich in any business endeavor, but that’s even more true when it comes to blogging. Does the fact that you probably won’t get rich mean you shouldn’t try your hand at blogging? I hope that’s not the case because there are strong reasons to do it even if you won’t. And think about this…if the only reason that you’ll try anything is on the prospect (promise?) that it will make you rich, you probably won’t ever try anything! Well, at least not anything that actually has a realistic chance of succeeding! So you won’t get rich from blogging, but what about a chance to make an extra $500 or $1,000 a month as a side venture—is that too tough to take? Not only is that far more doable than getting rich on a blog, but for a lot of people that would cover a few financial shortfalls. You can use it to build up an emergency fund, payoff debt, or to fund your retirement plan. Even if a blog is just a side business, it will also be a way to diversify your income sources. With raises and promotions harder to come by, and jobs harder to keep, an extra source of income could relieve the stress of relying entirely on a single paycheck. And here’s something else…start making a few hundred dollars per month and you can eventually make more. For many bloggers and would-be bloggers, money isn’t the main motivation for having a blog. In a world dominated by institutions and talking heads, blogs are just about the only place you can go and actually have a say about what’s going on. I don’t know about you, but no one has stuck a microphone in front of my face and asked my opinion about any major issues—or minor ones for that matter. Blogging is a chance to share our opinions and ideas with the world. It may not have anywhere close to the impact of the national TV networks, but it’s a platform, and one that will be read by others who may act on it. And sometimes those platforms go viral and have an even greater impact. Get enough traffic coming to your blog, and you can make money with it even if that wasn’t your initial intent. One of the under-appreciated aspects of a blog is its potential to support a business. You can, for example, use a blog to promote an insurance business, product sales or just about any business you have. A blog isn’t just an advertising platform for a business, although it clearly has that aspect. What it does to an even greater degree is position the blog/business owner as an authority in that business. It’s no secret—people prefer to do business with people who are credible, and a blog helps you to establish that credibility. As an insurance agent, for example, you can use a blog to give out volumes of free information related to the insurance business that will encourage people to do business with you. They don’t have to meet you face-to-face because they’ll have read and benefited from the information you’ve provided and you’ll seem like a trusted friend. A blog works even better when you’re trying to generate business beyond your local market. Since the internet has no borders, your blog will reach many people well beyond your immediate area. In this case, the blog itself may not be a money maker (though it can), but it creates a financial benefit from a different direction. No matter what anyone tells you, if you don’t know exactly and precisely what you’re doing blogging is not easy. You need a blogging road map, and lots of instruction to help you when you get to each step in the process. The Blogging Your Passion University series has been developed by Bob Lotich and John Milligan, who have been quite successful in the blogging realm. For just a few dollars you can get each of this three part series that was designed with the beginning blogger in mind. Trust me, you’ll save a lot more than you’ll spend on this course just in the money you won’t lose in start-up expenses, to say nothing of the income you’ll start earning a lot sooner than if you try to go it alone. 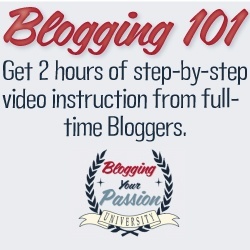 Check out Blogging Your Passion University 101 , and see if it doesn’t move your blogging business into high gear. Does blogging have to make you rich in order for you to give it a try? Or would you be willing to consider it for other purposes, even if it won’t ever make you rich? 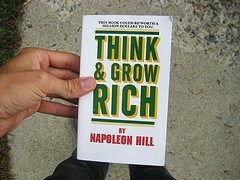 It’s amazing how we’re attracted to those “Get Rich Quick” schemes. I enjoy blogging, any money is just an added bonus. Hi Charlotte–Get rich quick is an effective lure. Even if we know it isn’t true, we still want to check it out. There’s a bit of a quick adrenaline rush sometimes, maybe because the prospect of getting rich is so exciting. Focus on people. Help. Connect. Money flows to you with ease. Blogging prospers you AFTER you’ve prospered others. You can gain wealth with blogging – if you so choose – by simply helping and connection. Few people understand how easy making money with blogging becomes after you persist with this. Work daily. Work light. Work intelligently. More would desire to prosper with blogging because few people would turn down writing articles, connecting with folks and getting paid for it. I’m not sure that anyone comes online to get rich but the sheer ability of a headline such as “Get rich blogging” is so powerful that we change course. I agree Alex. “Make a small income by blogging” sounds so humble, yet for most people that small income could open up a few doors. I suppose it’s the reason why people would rather buy lottery tickets than get a second job. Overnight riches. Get rich without doing anything. It’s very appealing even if it’s a complete play on emotions and nothing else. I’m not sure that I will ever make a penny off my blog, but I know that I am providing useful information to my target audience. Cash would be great, but I have to keep reminding myself that it is just a bonus. Though bonuses are always welcome! Hi Kate–The appeal of just being able to make an impact with your blog is often overlooked in the pursuit of making money on it. I also think that if a blog provides real value, the money will follow. A blog can also draw/create other income avenues that you never anticipated – that’s how I got into freelance blog writing. So keep at it and see what happens.